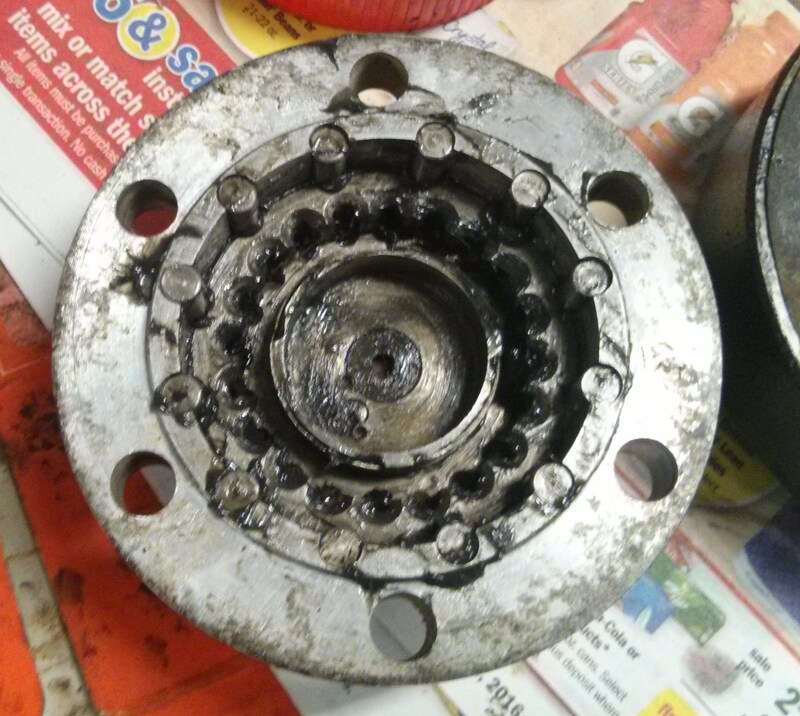 The passenger side of the car has the odd locking hub so I decided to clean up the set of used Warn M3B manual hubs from my parts pile. 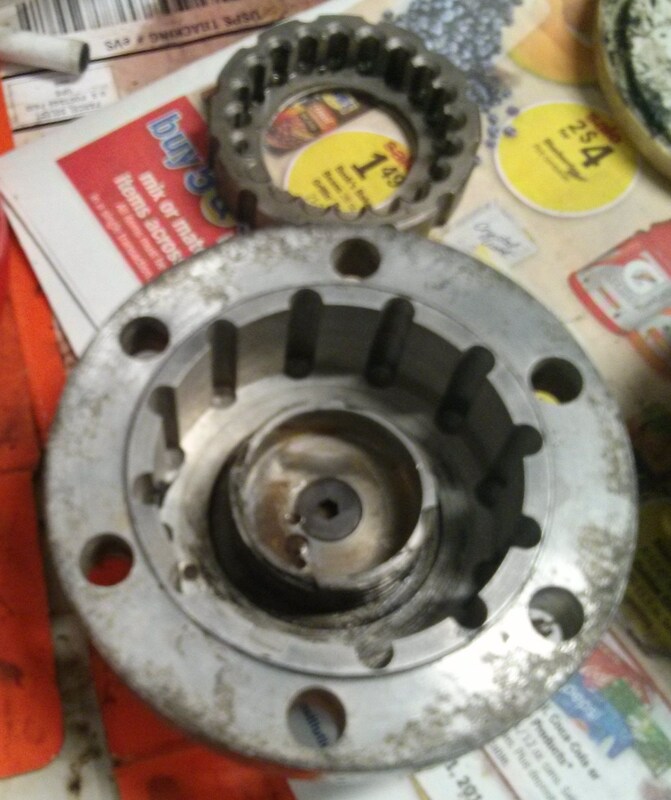 This is the outer part of the hub where the locking knob is. 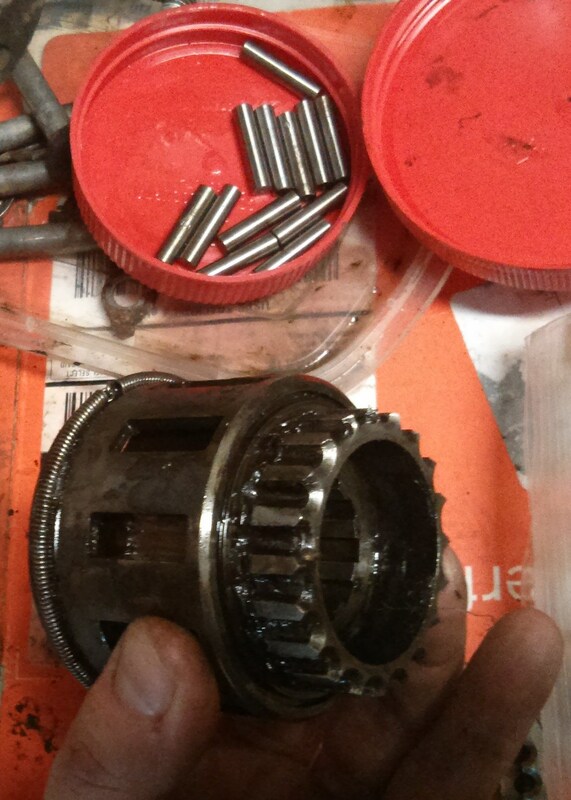 After washing the worst of the gunk off I started pulling out these locking pins. 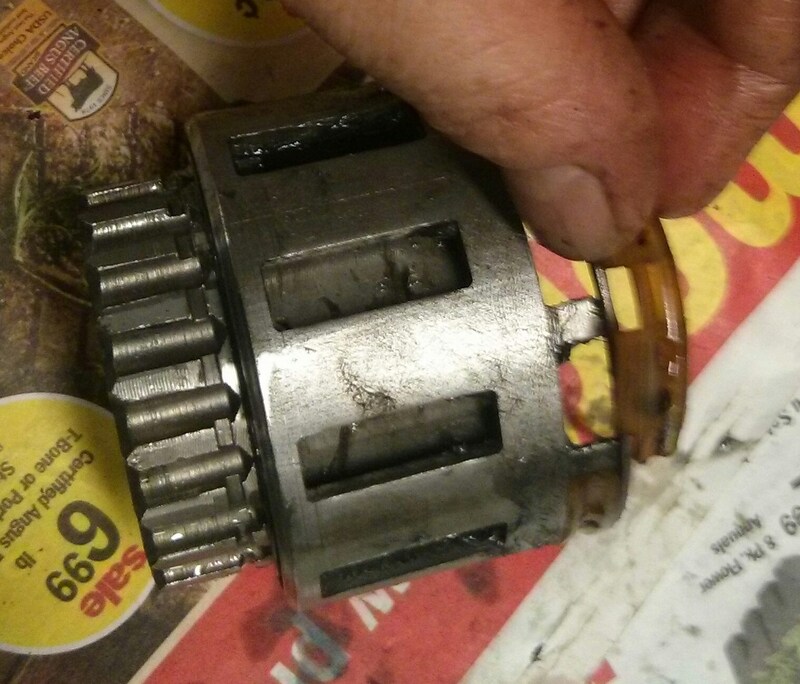 With all the pins out this gear/ring thing unscrewed from the control knob. 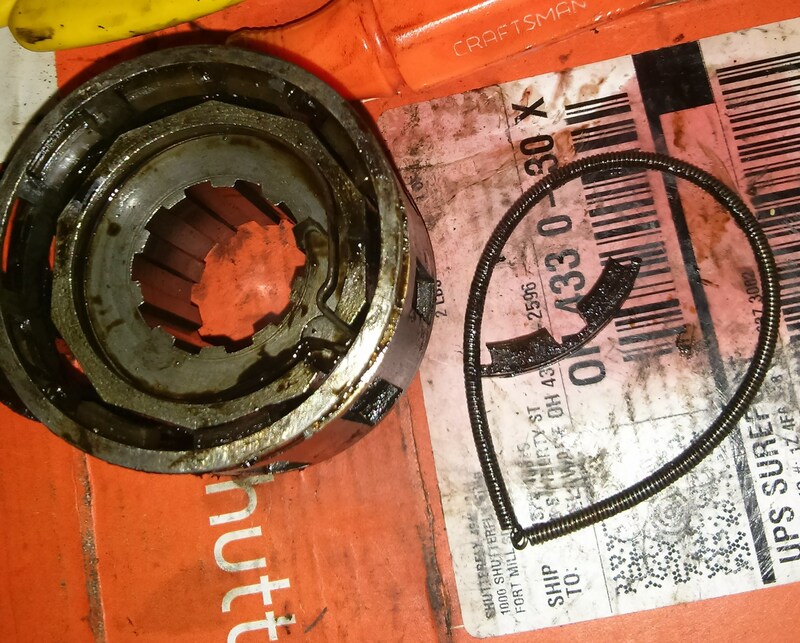 The body of the hub has two snap rings that appear to be holding it together. I have no idea what I am doing here so this is where it gets a little scary. 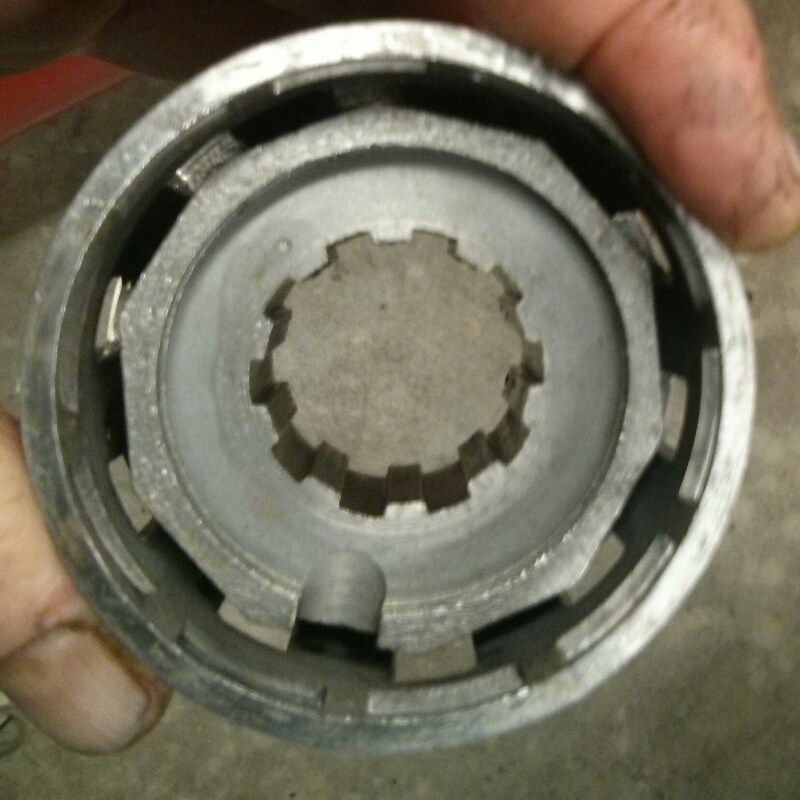 There is another inside snap ring on the back side as well as a spring holding something together on the outside. 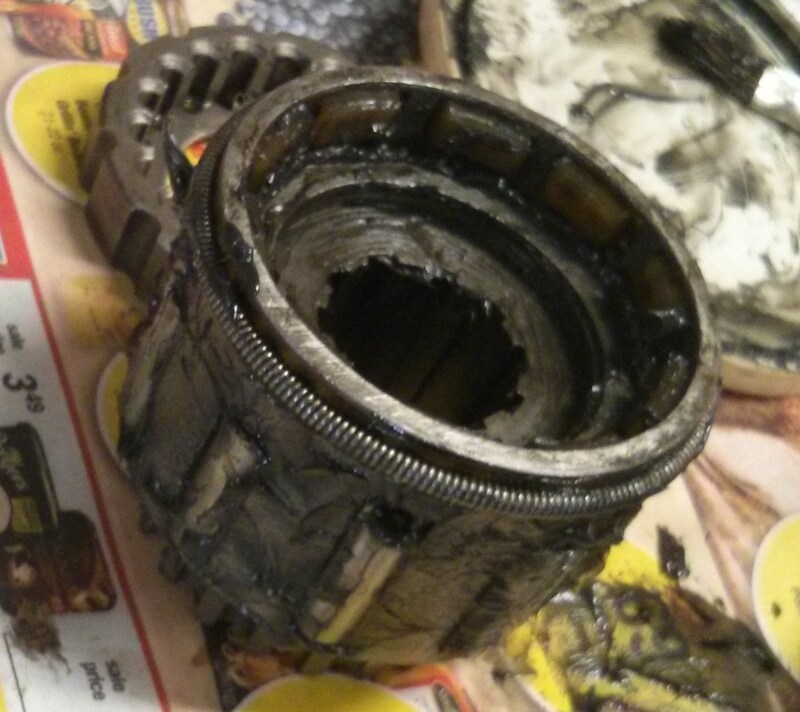 Rach removed the first snap ring and the innards slid out of the hub body. And here are the innards. The rollers are just sitting in there. Removing the outer spring from the other end allowed the removal of these nylon pads. They go all the way round the hub. 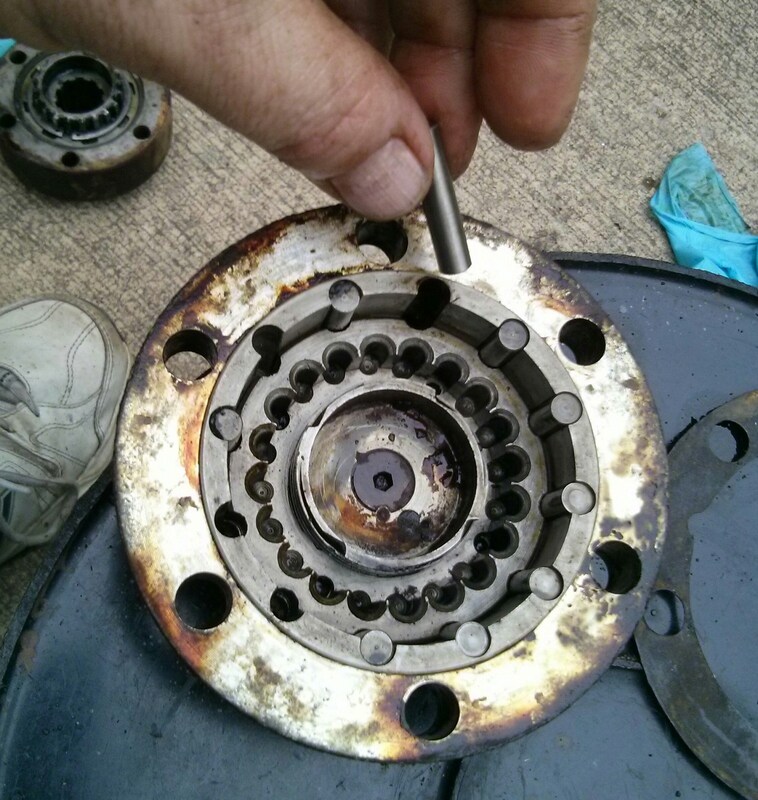 It also allowed access to the inner snap ring. 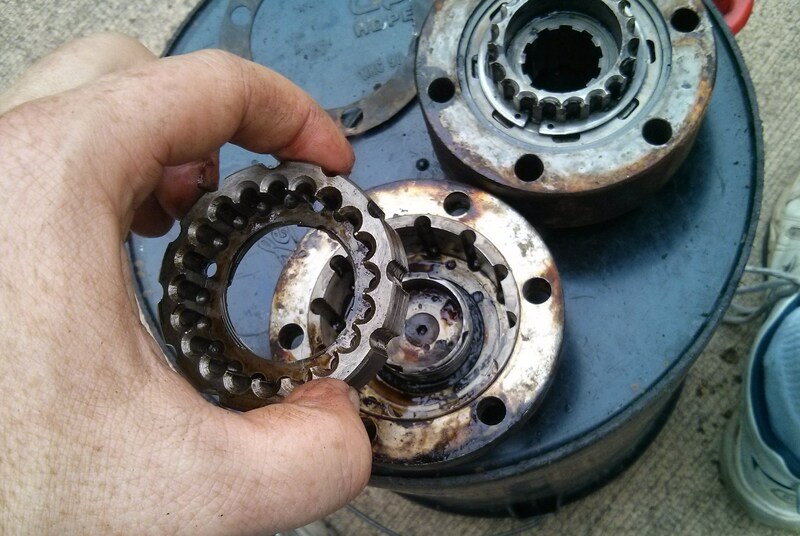 Removing the inner snap ring just allowed the outer roller cage to rotate freely around the inner core. We cleaned it up so we could see how it works better. We can see how it works now. Normally the hub sits with the rollers lined up with the 9 flats on the center of the hub. 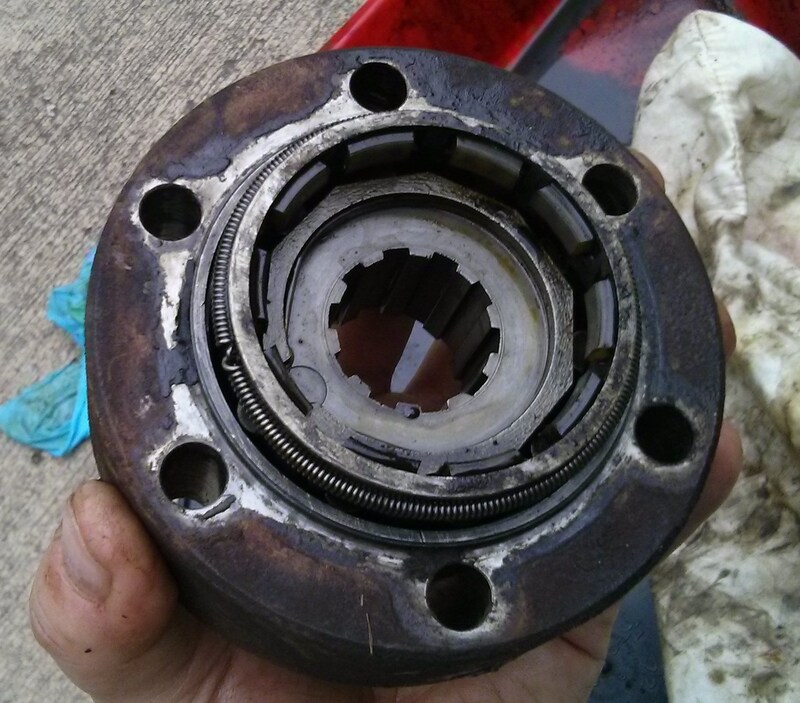 When torque is applied to the center spline from the axle it turns the center forcing the rollers out against the outer body of the hub and the wheels turn. 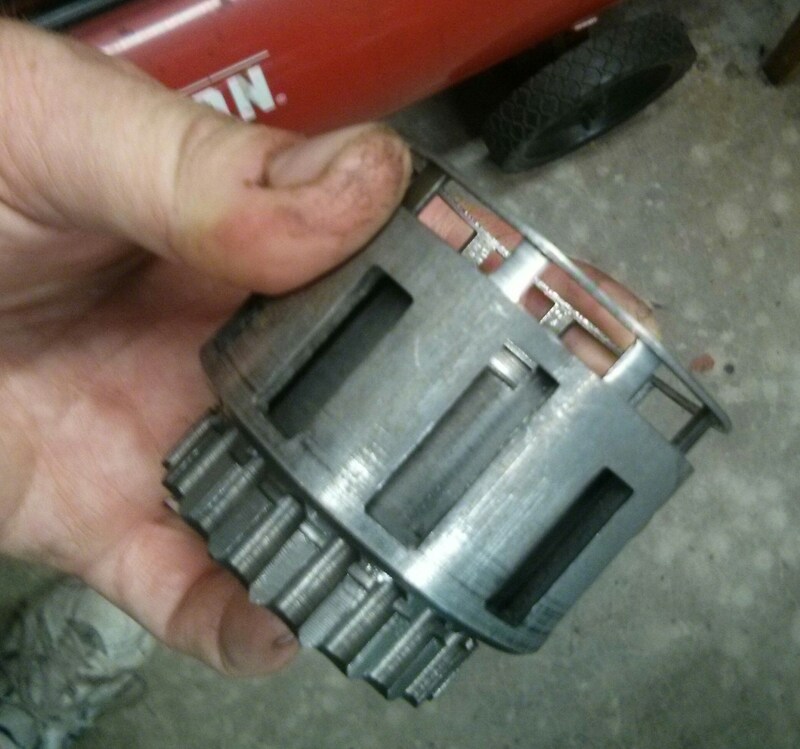 This slot in the roller cage is longer than the others to trap the ends of that inner spring clip. This keeps the orientation of the cage to the hub the same all the time. Not sure why that is important since I don’t see how it can move with the rollers in there anyway. Cleaning parts. The good news is the hub appears to be in great shape. 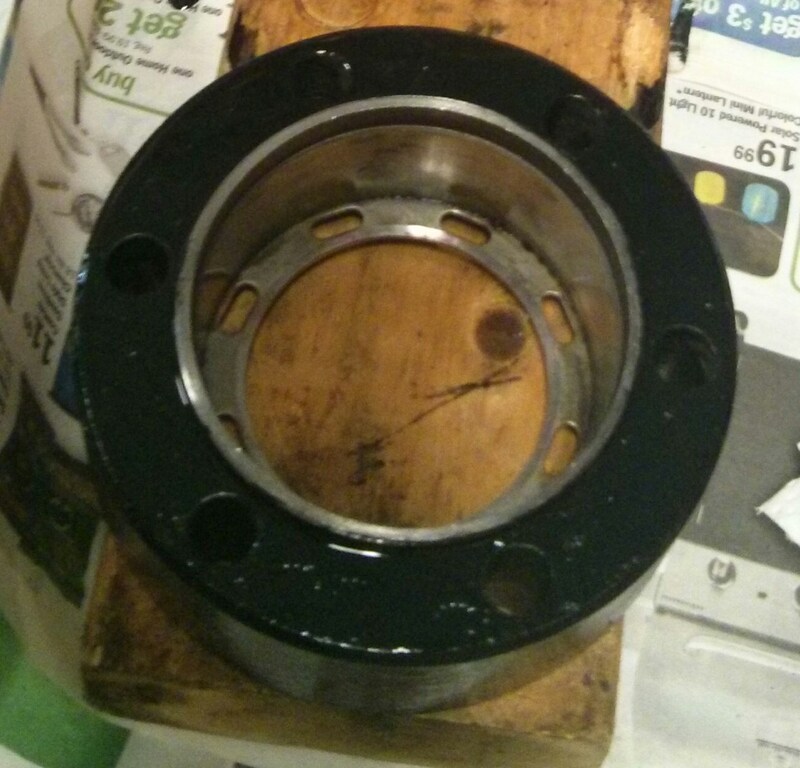 Rachel painted the outer body of the hub satin black. 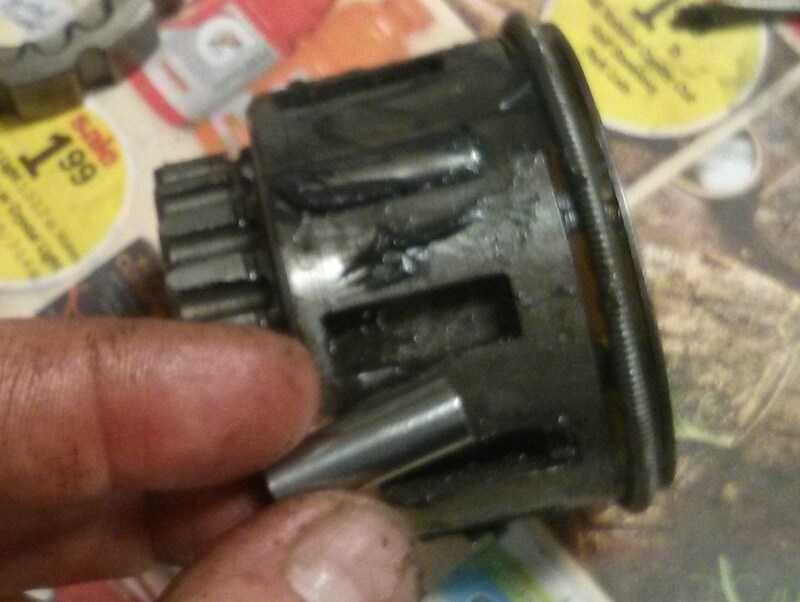 We also cleaned up the knob end of the hub. Rachael painted the letters and put red dots. 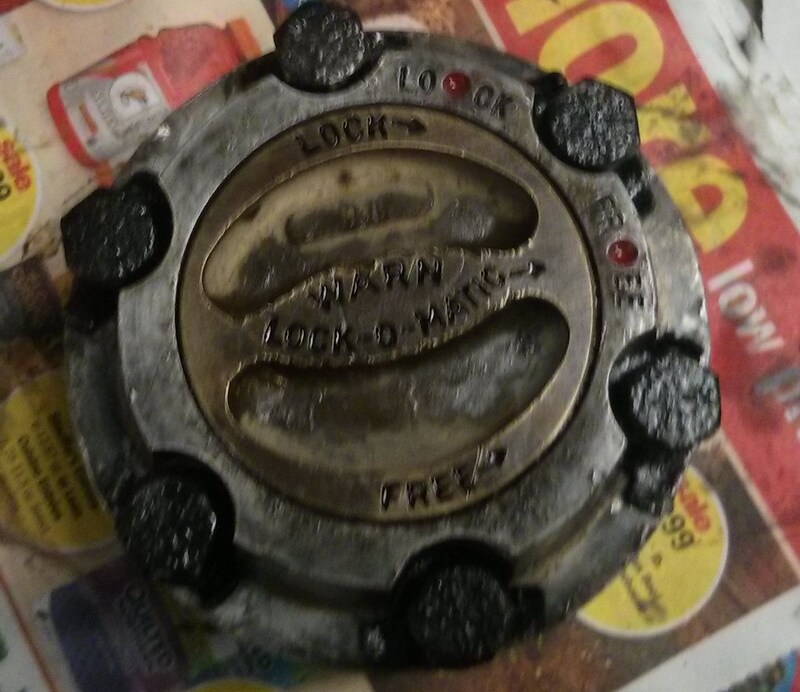 The control knob is bronze and the cap is some sort of aluminum alloy. So we tried to be gentle with it. 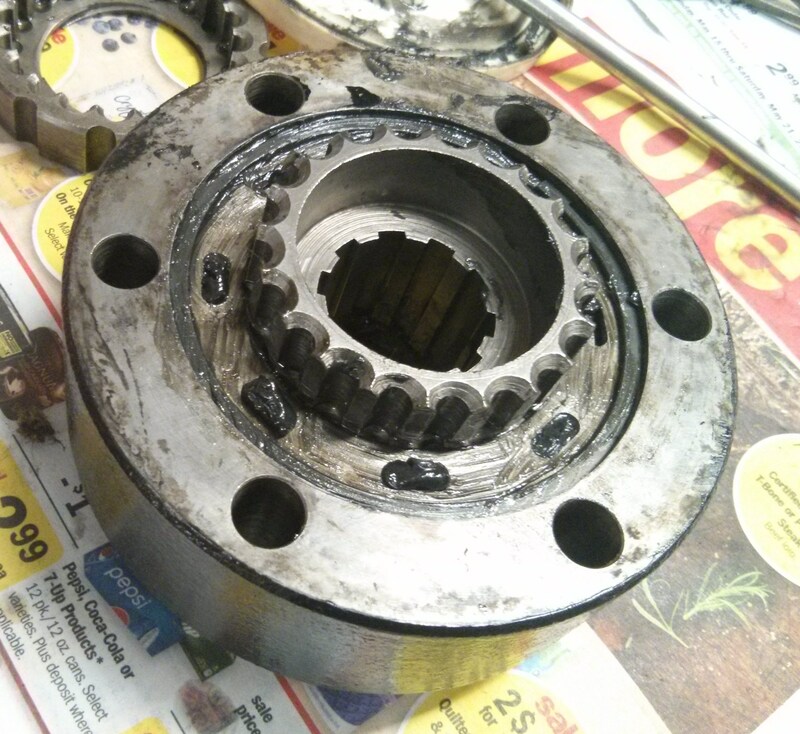 Now it is time for some reassembly. First of all let me apologize for the crappy pictures. 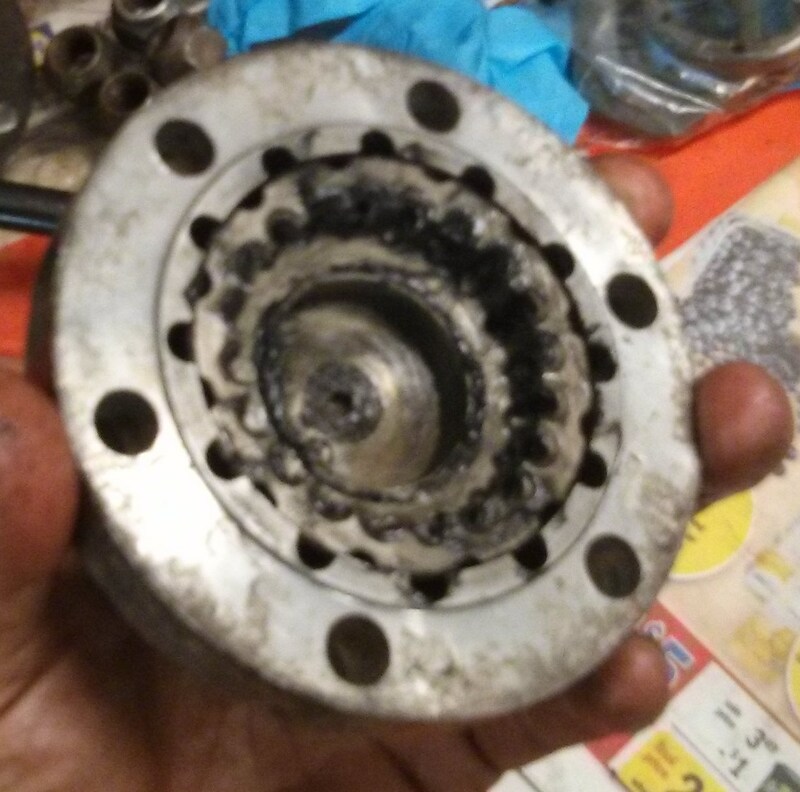 Turns out it is hard to take good pics in a dark garage when your hands are covered in wheel bearing grease. I am not sure my phone will ever be the same. 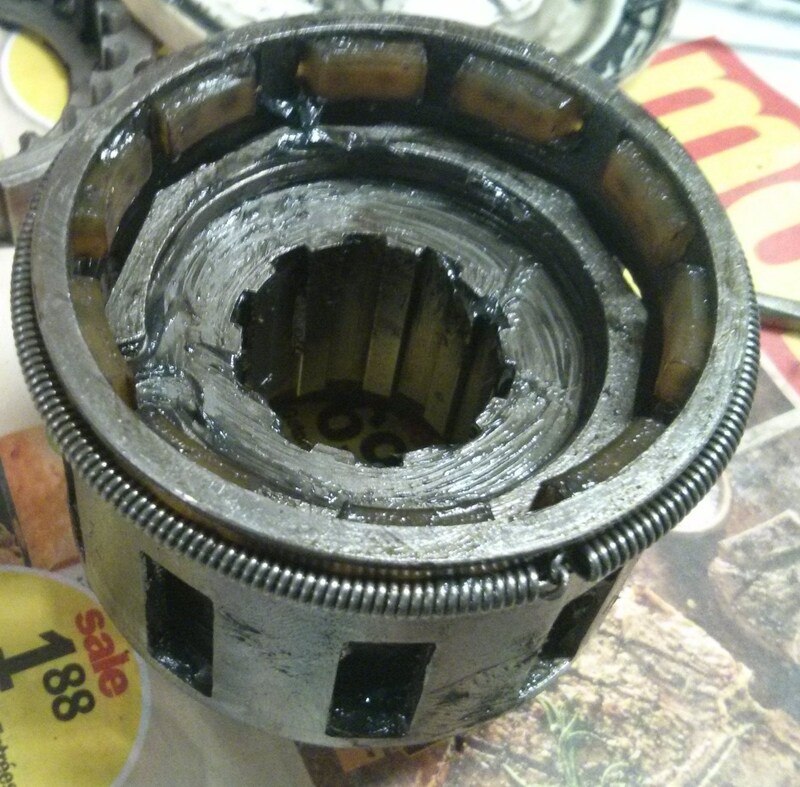 First step is to put this inner snap ring back. When I do the other hub I will leave this in place. Taking it out did not get me much. This was easy to put in except I lost my grip and launched it across the garage. But I found it quickly. Next these nylon pads go in. They sort of snap into the holes around the end of the hub. 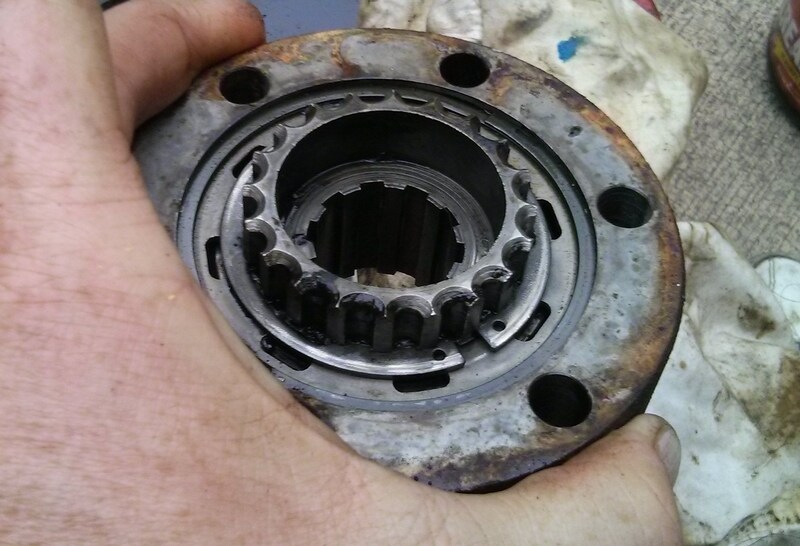 This spring goes around the outside and holds the nylon bits in. Notice I am greasing the hell out of everything. Next the cam pins go in. I think there were nine of them. 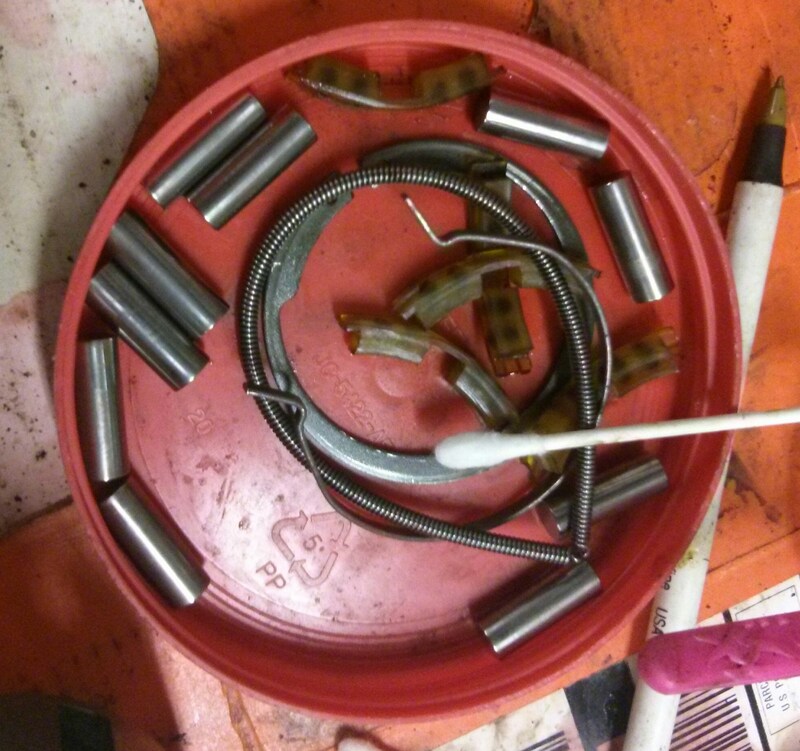 I packed grease into the cage and coated the pins. So this is where the pictures head downhill. Pins are in. They are just sitting there for now. 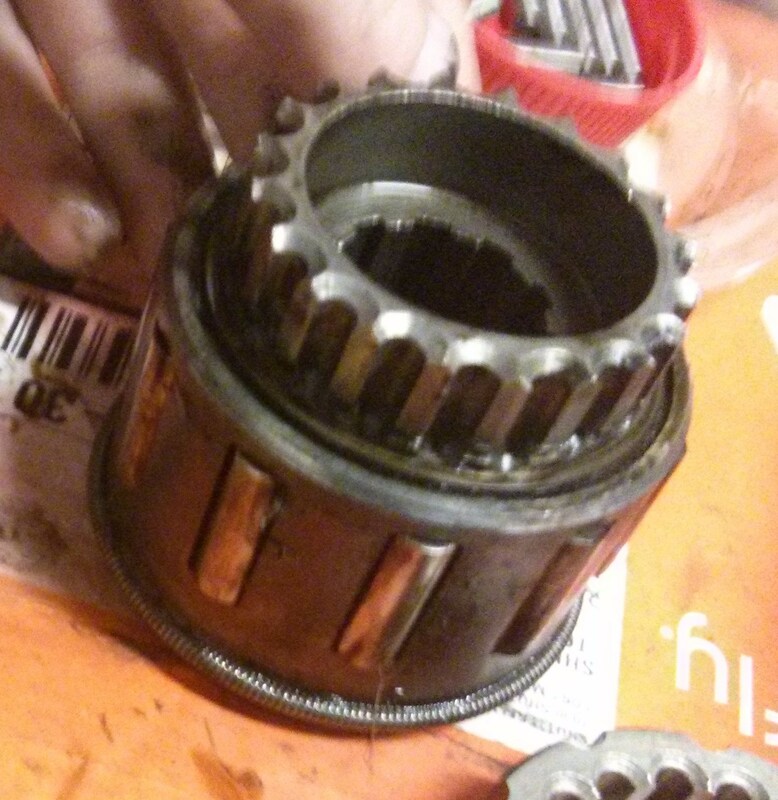 The hub housing serves as the outer “race” for the pins. 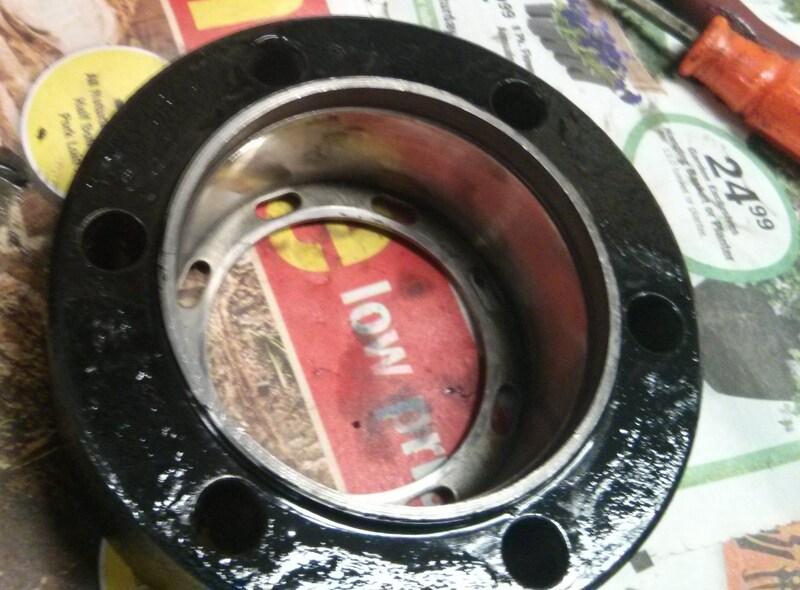 After coating the innards with yet more grease I put the inner hub assembly into the hub housing. 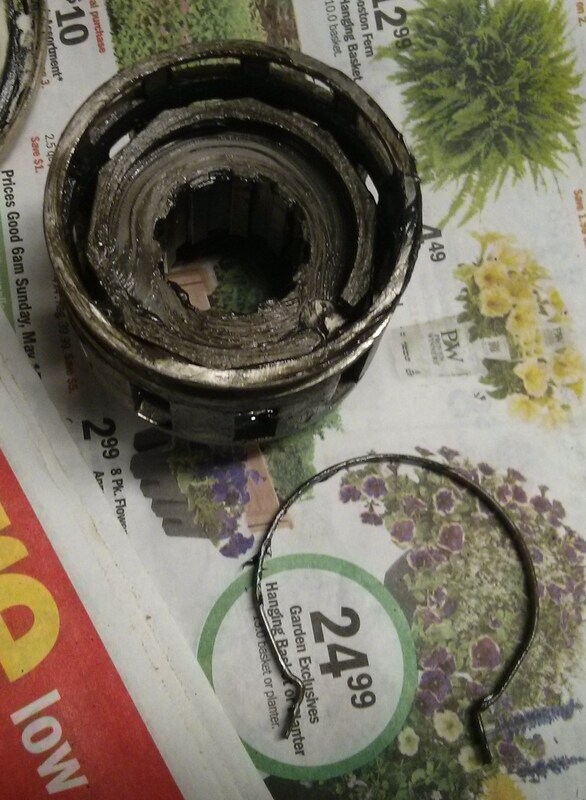 The whole thing is held together with a snap ring. 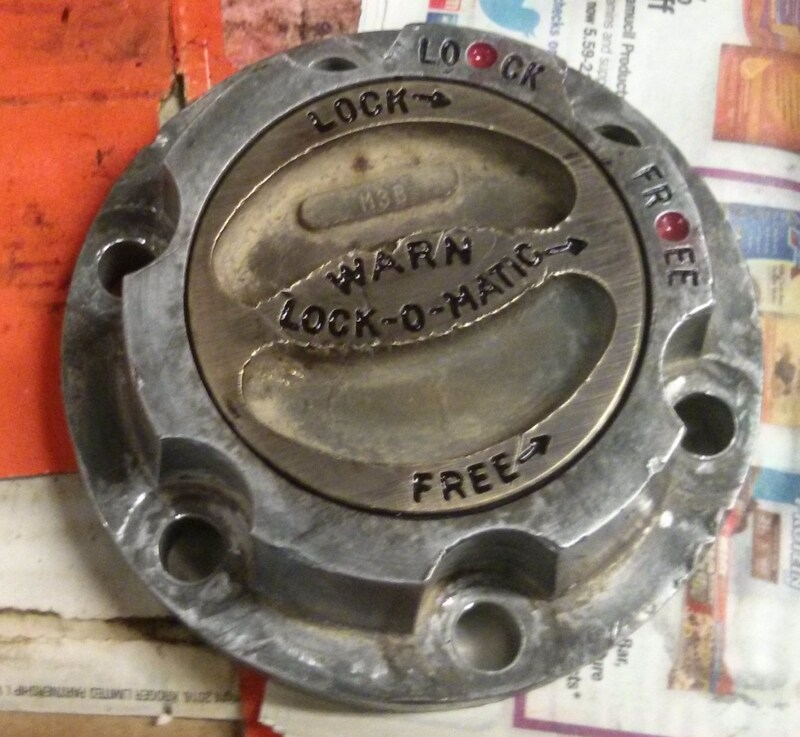 Next it is time to assemble the locking knob. The top piece screws onto the center raised bit of the lower piece. When the locking knob is turned to the lock position the inner piece “screws out” and engages the teeth on the top of the hub body. This locks the hub together. Moving the knob to the free position retracts the inner piece and unlocks the hub. Here I have installed the 12 pins around the perimeter. These keep the inner bit from turning and serve as “rails” for it to slide in and out on. 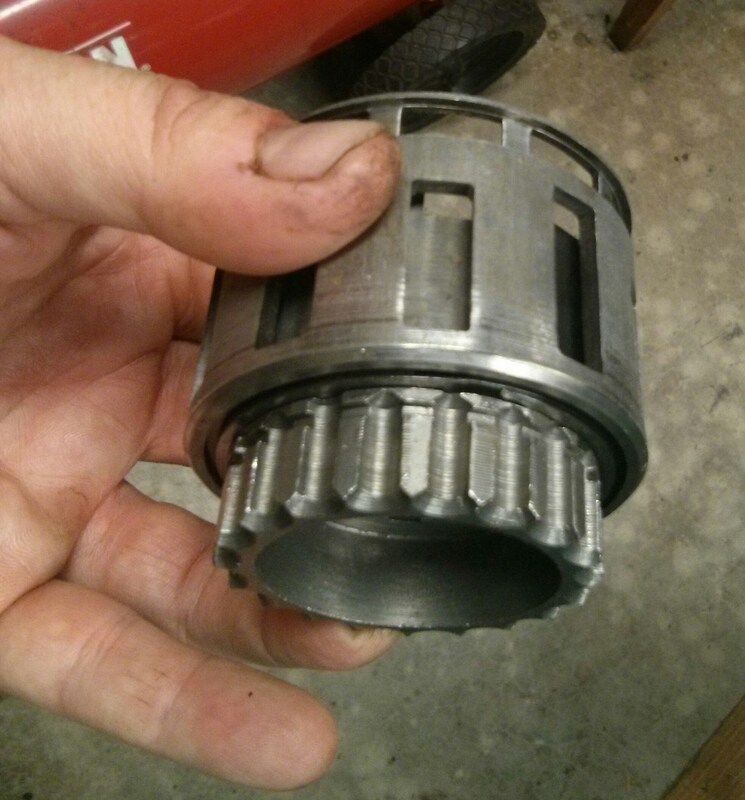 The two halves are held together by the bolts that tie the whole assembly to the wheel hub. I reused the old gasket. 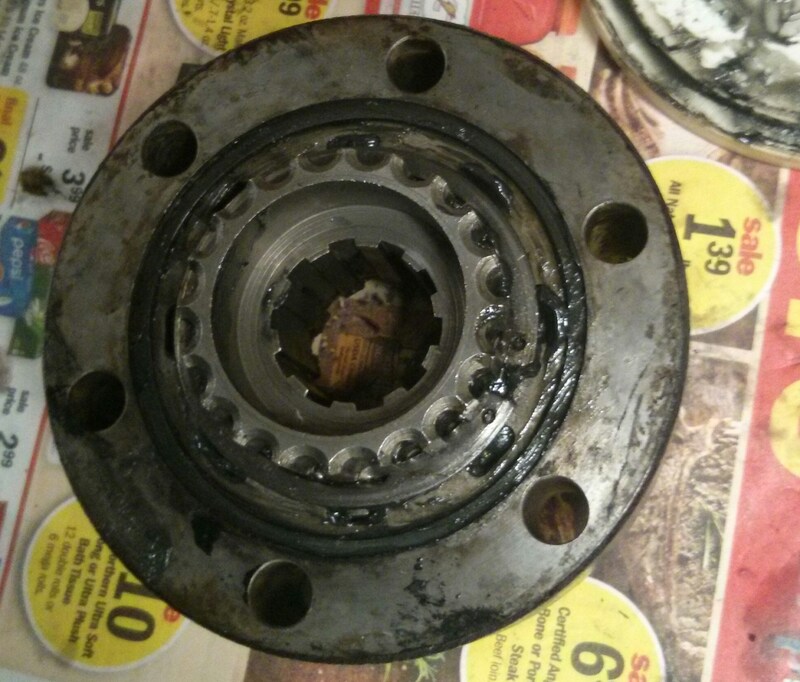 It is in pretty sorry shape but it just has to keep grease in and water out. This guy is ready to go back on the car as soon as I finish cleaning up the brake drum.